Her co-stars will be Irrfan and Iranian beauty Golshifteh Farahani. Subhash K Jha reports. Last seen in Rakeysh Omprakash Mehra's 2009 drama Delhi 6, Waheedaji is headed to Jaisalmer where she will feature in director Anup Singh's Mantra -- Song of Scorpions. Starring with the legend will be Irrfan Khan and Iranian actress Golshifteh Farahani, whom Indians may remember from Ridley Scott's Body of Lies, where she played Leonardo Di Caprio's love interest. Anup Singh's debut film Qissa, which released in India this year, also featured Irrfan. Mantra -- Song of Scorpions is about a young woman in Rajasthan who sings and heals people. When she realises that her life has been poisoned by the man in her life, she goes on a mystical journey to find the song that will heal her. Golshifteh -- who has acted in some of Iran's most memorable recent movies -- will play the singer. 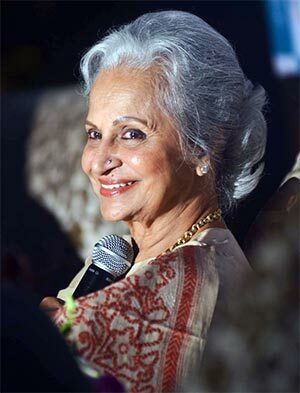 Waheedaji -- who will also be seen in Kamal Haasan's Vishwaroopam 2 -- plays an an important character in the film.